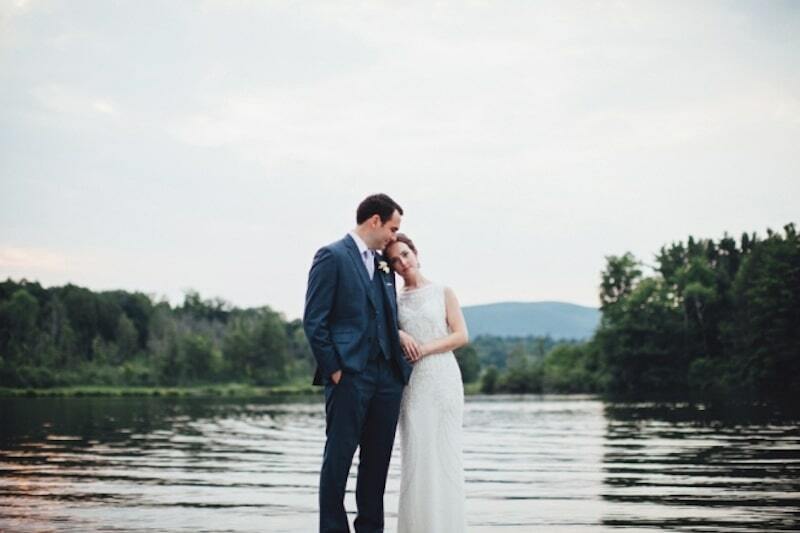 Sheila and Brian were married at a lakefront home in the Berkshires…what a perfect setting for our sailcloth tent! They chose the waterfront for their ceremony, and they asked us to create a floor that would compliment the scenery, but would allow guests to have a worry-free walk. We used our barn board flooring—often used beneath our tents—to create a ground level platform that leveled out the dips and divots of the lawn. We used additional barn board flooring to create an aisle for Sheila and her father to walk down. Underneath our sailcloth tent, guests were seated at a mix of our all-wood farm tables with turned legs and real linen runners, and our standard round tables covered in a linen cloth. Both styles of tables were flanked with our fruitwood chivari ballroom chairs and set with classic white china, our mod stainless flatware, crisp white cotton napkins and our elegant Regal stemware. For more images of this wedding and a complete vendor list, check out Carats and Cake.